Exchange Database is stored in .edb file format. Usually, users need to deal with the various problems occur while accessing Exchange server database. One of such problems is the oversizing of Exchange database EDB file. If you getting this same problem, then no need to worry at all, you landed on the right place. Every file has some specified size limitation, if that specific EDB file (in case of Exchange server) size has been increased out of its limit very fastly, then server run out of space problem might occur there. Here in this blog, we will be discussing the different solution to handle Exchange EDB file is too big issue. Additional trick: – The easiest and useful way to reduce Exchange EDB file size is just Convert Exchange Mailboxes to PST Format after that delete source files from Exchange Server database and keep the resultant PST file as a backup for future need. This issue is needed to be resolved in such a way that even a single bit of data do not get skipped or missed or lost. When a large amount of data gets stored and it is continued to do so, then in such case EDB file automatically starts growing which becomes the main causes for its corruption. Now if some of the data have been removed or have been deleted even then the file will not be reduced. The deleted data free space will be occupied by white spaces. This overloading of data on the server may result in its downtime for users. We have provided multiple solutions to come out of this situation. By creating a new exchange mailbox and copying data of older mailbox to the newly created mailbox. By performing offline defragmentation to compress edb file. By moving the Exchange database mailbox location. From the above solutions, moving mailbox procedure is the somewhat complex method and hence involves many risks for data loss. As in this method, a large transaction log is generated and it may take several days and hours to get accomplished completely. From the above three methods, defragmentation is proved to be an effective for reducing exchange mailbox database EDB file size. In Exchange Management Shell (EMS), the EDB file size and all the white spaces can be found out by executing commands there. After determining the EDB file size, it can be reduced by execution of Eseutil to defrag the mailbox. The exchange database must be dismounted before the initiation of defragmentation. The users will be unable to access their emails while defragging procedure is continued. During this defrag process, a new file gets created, all the three file (old file, new file, a temporary file generated by Eseutil) exists on the same system. There must be enough free storage space for successfully performing of defragmentation procedure. In a situation, if enough space does not exist on the hard drive, then for execution of Eseutil command another location can be specified. By executing the above steps, you will notice that the EDB file get compressed and the white spaces get freed up. Exchange Management Console can be used to dismount database and this can be done by selecting the Mailbox, then right click on it and then select Dismount Database option. An alert message box appears to dismount the database temporarily so that to accomplish move database operation. Click OK to continue. The above-mentioned solutions are not helpful in the case if the Exchange database get corrupted because of the continuous increasing of EDB file size. 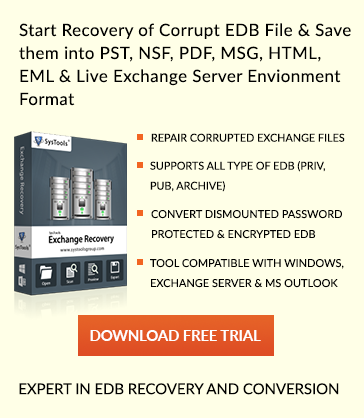 To resolve this corrupted EDB file issue, Exchange Server Recovery can be used so that to make the database healthy and then solve the oversize Exchange mailbox database problem by reducing it.